And the rest of the standard stuff: wifi, bluetooth, gigabit ethernet, etc. I also purchased a ViewSonic VX2035wm 20.1″ wide screen LCD monitor. Running in a dual monitor setup with the laptop screen. I’m in heaven. I’m slowly trying to transition the Mac as my primary machine/platform. I’m loving it so far. I even did some unix “hacking” the first day I got it. I was able to give my Palm TX internet access via a bluetooth connection to the Mac. Nerd attack. Left to right: ViewSonic GS790 monitor plugged into my Dell Inspiron 700m laptop (not pictured) running XP, the new 20 inch LCD, the MacBook on the right. They’re all sharing a single Microsoft keyboard and mouse thanks to the jaw dropping power of FOSS Synergy. I can’t praise Synergy enough. 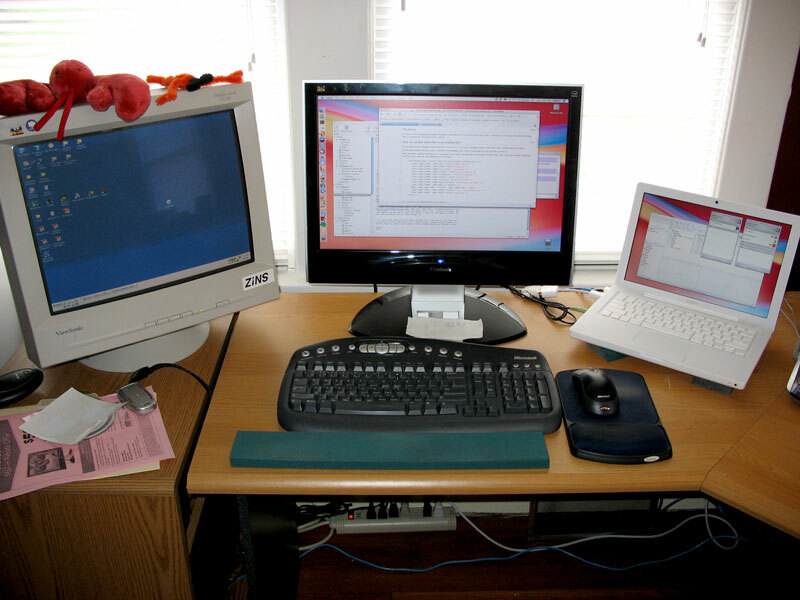 You hook your keyboard and mouse up to a single computer, then install the Synergy client software on each computer you want to share the keyboard and mouse with. Then little elves and wizards crawl inside your computers and start casting spells. At least that’s how I think it works because it looks like magic to me. Watch in amazement as you drag your mouse from one screen to the next jumping from XP to Mac and back again. Amazing. I’m loving OS X so much that after about only 2 months of using my Mac, I bought my wife a MacMini for Valentine’s day. It replaced her ailing generic beige box PC. What better way to say “I love you” than with a computer running OS X?